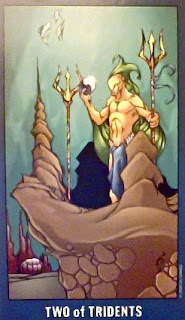 Today's Draw: Two of Tridents from the Undersea Tarot. Are you conscious of the intentions, energies and subtexts beneath the interactions you participate in? Do you take responsibility for the energy you bring to a dynamic? Or have you never considered it before? 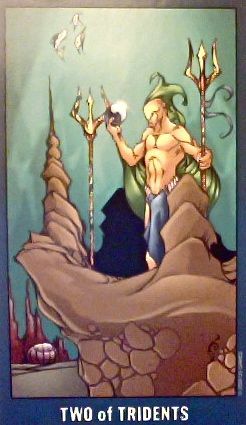 This card equates to the Two of Wands, which is about control and strategy and dominion. In the little white book for this deck, it words it as "influence over your surroundings," which made me think of something I heard once. Many of you might be familiar with Dr. Jill Bolte Taylor, who is the neuroanatomist that wrote My Stroke of Insight and gave a TED talk that went uber viral. The story is that she had a stroke that, in conjunction with her existing expertise, helped her and the world better understand what happens during a stroke. One of the side effects of her stroke (based on where the damage happened) is that she now has a greater sense of peace, spirituality and understanding about the energies around her. While she was in the hospital, without her ability speak and just basically in a bad way, nurses and visitors would come in her room and they might be having a bad day or being negative or sad about her condition and inside of her, she'd be thinking, "hey, I'm doing all I can do to recover here and am being bombarded by the negativity of others." What she wanted, but couldn't say at the time, is "take responsibility for the energy you bring to me." Taking responsibility starts with being aware...of your mood, of your words and of your intention. Many times people are unaware of these things. But an interaction between two people has two intentions and two energies riding along with it. And our intentions pretty much always have to do with serving ourselves. If you're going to the hospital to comfort a friend, for example, chances are, beneath your desire to comfort your friend is another desire to assuage yourself and your feelings about your friend being sick. If you visit them, you'll feel like a good friend. You won't feel guilty. You'll soothe your feelings of helplessness by trying to help...there are a number of reasons that could run beneath it. But bottom line, we don't do things that have no payoff for ourselves. At least we don't do them more than once. So, because we often feel we spend all our time serving others, it's important to understand that we serve them because of what we get out of it. Just that understanding alone can change our perspective the choices we make. And it's also important to understand that your intention comes with an energy attached. For example, if you visit a friend because you feel you have to, the energy will be different than if you really want to be there. And when it comes to energy, whether the other party is attuned to it or not, it has an effect on them. A number the entries here have to do with being conscious of the way we walk through this world. The reality is, we'll still move through unconsciously much of the time. But the goal is to start becoming aware. In some ways it's like breaking a habit. There will be times you'll conscious of yourself acting in a way that is incongruous with who you are and who you want to be. And you'll keep acting that way anyway. The other day I was in a conversation with someone who I consider fairly enlightened, but she was playing the victim about something. And I could tell that halfway through our conversation she realized she wasn't being honest with me or herself. But she kept up the ruse anyway and her responses became lamer and lamer and shorter and shorter until she finally just backed out as gracefully as she could. I didn't confront her about it. Or judge her. I just listened. But I also didn't say anything that supported her self deception. So she knew. And I knew. She *wanted* to feel the way she felt. And hopefully she asked herself why. This is how we move toward toward taking responsibility. Once you start becoming conscious of your intentions and energies, it becomes harder and harder to deceive yourself. That's both good and bad. Bad because it's humbling and might bring up some pain. Good because it moves you closer to your authentic self. And it all starts with being aware of what you're bringing to those around you and taking responsibility for it. Bottom line is we could all use to be kinder and more generous with our intentions. And while we may like to think we're doing it for others and the world, ultimately we're doing it for ourselves. We can come from a place of healing energies, neutral energies or toxic energies. And whichever we choose dictates what kind of energies and chemistries we want running through our veins. That doesn't mean you have to let things others do to you slide, rather it means you can confront from a loving, compassionate place or you can do it from it an angry toxic place. A person who acts unconsciously lets the other person decide, because they are reacting to the others' energies. The conscious person stays in the drivers seat by having the presence of mind to take responsibility for their own energies and actions.